I would like to introduce you to the new “Burly” parts. It has been more than 2 years since the “525” (5/25/16) parts were released and I am very excited as I have been toying around with these ideas ever since. No new hardware is needed just some new printed parts, so, free update. How about a quick list. More rigid XYZ pieces, the main focus of this update! #6-32 and 4mm tool mount versions. The 5″ bolt now fits better. The Nut Trap is revised for #6-32 & 4mm screws. The Nut trap has a printed spring for easier use. The Nut Trap should work in all reasonably sized tubing and wall thicknesses. 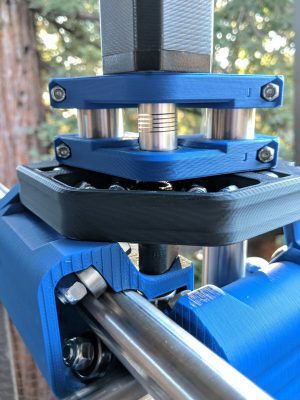 Stronger Z clamps with no added overall build volume. Tiny tweak to the corner spacers for a better fit. No hardware changes from the “525” ** see below. No more allthread parts, T8’s are the better option and cost difference in minimal. A little more fidgety to put together. I had to bury some of the nuts more to gain strength. These are nuts that should only need to be tightened once so really no big deal. 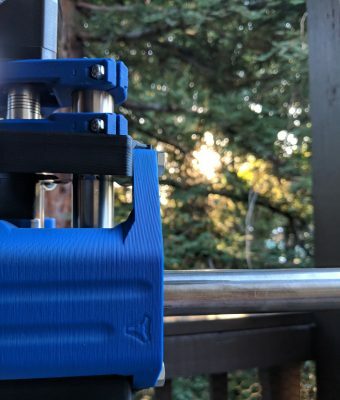 I suggest you reprint all the main center and Z axis parts, XY, XYZ, Spacers, and Z mounts. The tool mount is the same unless you want the hidden logo or 4mm nuts. The corner spacers are fine unless you are doing a rebuild than might as well. The nut traps are not dimension-ally different so use what you have. As always the forums are the best place to ask me/us questions. I have a thread for these parts here. I have updated everything including the instructions so if you see anything I missed please tell me…there are tons of pages to edit nowadays. Thingiverse links, while you are there let’s try and give this thing a little boost. Choose one or all… please give it a like, leave a positive comment, post a “make”, or add it to a collection. Old Parts, just in case. 23.5mm, 25mm, 25.4mm.